Save it as a .csv. As this takes quite a bit of time, I feel that there must be better ways to do this. It would be great if I could have this scheduled to be done automatically or if there is some kind of an SQL query that could do this, because then I could use PHP to make a website that I could enter and have the query run when I press a button or something. So my question is: What is the most simple way to continually get the info from the .dbf file into my SQL server? After that, create a shedule for this BAT file using Windows Sheduler. The only issue remains, that you need to clear the destination table on MySQL database before the export process. 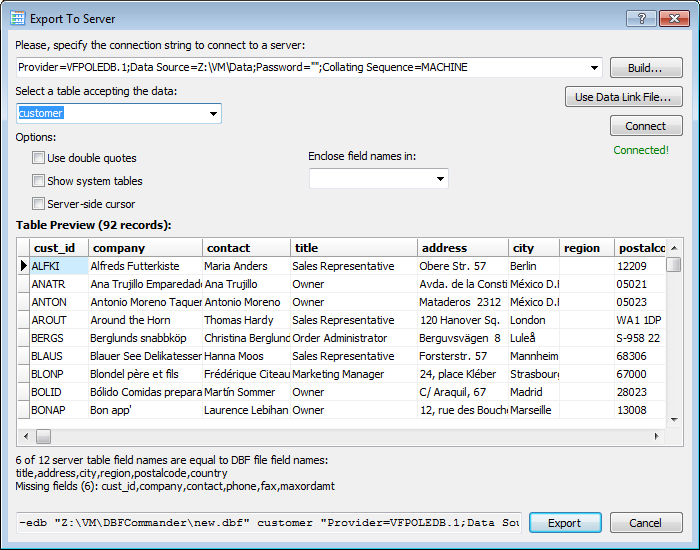 In the Export to DBMS window select the destination table you want to import source DBF file to, then click Export. The command line you need you can find at the bottom part of the window. More info on import and export DBF to a database you can find here. Detailed using of command-line is here. As you mention of doing in PHP. What is stopping you from doing it there. You could create one connection handle using a VFPOleDB provider to open the path location of the table, open and read the table. Then have a SECOND connection to your MySQL database open and ready to push the data there. Then, for each row read from the VFP OleDB connection result set, do whatever special cleansing you need to. Then, query from the MySQL connection if its an existing entry or not and if an add or update is necessary, then send the data respectively. Continue for the rest of the records from the VFP result set. Not the answer you're looking for? Browse other questions tagged mysql sql import dbf or ask your own question.